A child is considered at risk of allergies if a direct relative already (mother, father or sibling) has an allergy, because the predisposition to allergies is inherited. Currently about 20-30% of babies are affected by allergies. Allergies can manifest itself in many forms. 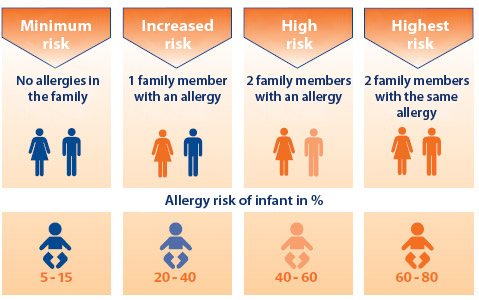 Whether a baby actually developed an allergy depends on many factors. One factor is the diet in the first months of life. A crucial role for triggering allergies makes the milk protein.